Special forces soldiers could not revive their mate, who fell down a crevasse. A SPECIAL forces soldier who tumbled to his death on New Zealand's deadliest mountain was "unlucky", as snow and ice gave way to a deep crevasse, a rescuer said. The 44-year-old was one of 10 soldiers from the Australian Army's 2nd Commando Regiment taking part in a training exercise on Aoraki/Mt Cook's Grand Plateau when the "bridge" he was on fell through. 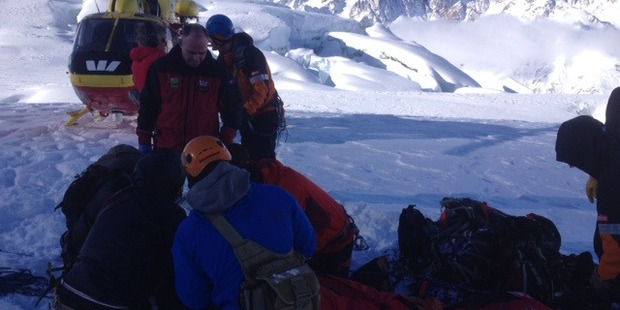 A team-mate was lowered down the 30-40m crevasse to retrieve him using a pulley system. "The soldier was recovered by his colleagues who administered first aid," the Australian Department of Defence said in a statement last night. "Sadly, they were unable to revive him and the New Zealand emergency services later declared the soldier deceased." Alpine guide Trevor Streat was called in to help the rescue effort and said emergency services were alerted about 12.20pm when a member of the group "raised the alarm" from the Department of Conservation's Plateau Hut, about 45 minutes by foot from the scene. The Grand Plateau is beneath the east face of Mt Cook and can be tricky to navigate due to the mix of ice and snow in the area, Mr Streat said. "Basically, the Grand Plateau is like a lake. You get this area, even though it's quite flat, where there's lots of crevasses because the ice is speeding up and going down the Hochstetter Ice Fall." The conditions created a "slightly elevated danger of crevasse fall" compared to other areas on Mt Cook, Mr Streat said. "You've got ice underneath one or two metres of winter snow, and there's been quite a lot of snow and wind lately so the crevasses get these bridges over them. "If you're unlucky one can break underneath you - that's what happened to this guy." When the Aoraki-Mt Cook Alpine Rescue Team helicopter landed at the site, the man had already been retrieved from the crevasse by his "mates", who were performing CPR, Mr Streat said. "They were extremely well organised. They were very calm and focused." The dead soldier was highly qualified and experienced in alpine, mountain and altitude activities, the Australian Department of Defence said. At the time of the fall, Mr Streat said the group were unroped, a "judgment call" climbers had to make on their own. "If I was in that area on foot, I would be wearing a rope, if I was in that area on skis I'm not sure what I'd be on. They were on little short skis." Mr Streat said the men were "very well equipped". "They were also trained to the point where they could go down the crevasse and rescue their friend which is actually quite a difficult thing to do in the circumstances." Canterbury Westpac Rescue Helicopter Service pilot Stu Farquhar said paramedics attempted further resuscitation efforts when they arrived. "They put the monitoring gear on him and he was confirmed dead." The exercise was suspended immediately and the body was flown off the mountain with two other soldiers. The remaining soldiers were to spend last night on the mountain. The New Zealand Defence Force said it was not involved with the training exercise. "Our thoughts are with our Australian counterparts as they deal with this tragedy," a spokesman said. More than 200 people have died in the Aoraki/Mt Cook National Park. Wednesday's death has been referred to the Coroner.